Snow will spread into southern Wisconsin this afternoon into the early evening, continue through tonight, then taper off quickly from west to east over inland areas Saturday morning. However, due to lake effect snowfall kicking in, we should see the snow continue across the far southeast through Saturday night. 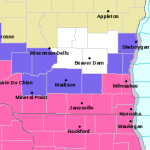 Travelers should be aware that higher snowfall amounts will occur south and west of Wisconsin, so if you’re heading into those regions, be prepared for slow and difficult conditions. Snow amounts of around 6 to 7 inches are expected inland near the Illinois border, with amounts diminishing quickly to the north. Milwaukee, Racine and Kenosha counties could see 6 to 9 inches right near the lakeshore due to the lake effect. Brisk northeast winds of 15 to 25 mph will cause some blowing and drifting snow. Total snow accumulations of 3 to 5 inches anticipated in Jefferson County. Highest snowfall totals will be in the southern portions of the counties.